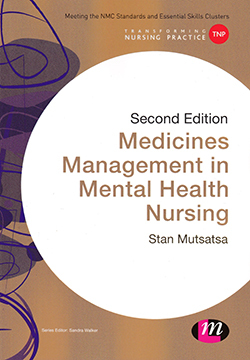 This second edition is aimed at undergraduate mental health nursing but would be informative for mental health nurses who have entered practice. Laid out over 11 chapters, the book aims to meet the Nursing & Midwifery Council essential skills clusters competencies for medicines management. The book is easy to navigate, with chapters dedicated to the major areas of mental health nursing including psychosis, bipolar disorder and anxiety disorders. Throughout each chapter are learning activities to provide readers with thought provoking clinical scenarios, with suggested answers provided further through the chapter. Useful chapters that cover pharmacological action of drugs will provide the reader with a firm foundation for clinical practice. The final chapter of the book contains the issues of medicines management for the multidisciplinary team and outlines the contemporary roles undertaken by clinical staff. As detailed throughout the book, nurses hold responsibility and accountability for aspects of their role in relation to medicines management. The author reinforces the importance of the nurse to understand these responsibilities to remain competent and promote patient safety for medicines administration. The book concludes with a useful glossary of terms related to medicines management and mental health with a comprehensive index. I would highly recommend the book to mental health nurses and undergraduate mental health students.